Afghanistan's opium production surged to record levels this year, despite international efforts over the past decade to wean the country off the narcotics trade, according to a report by the UN's drug control agency. The harvest this May resulted in 5,500 metric tons of opium, 49% higher than last year and more than the combined output of the rest of the world. 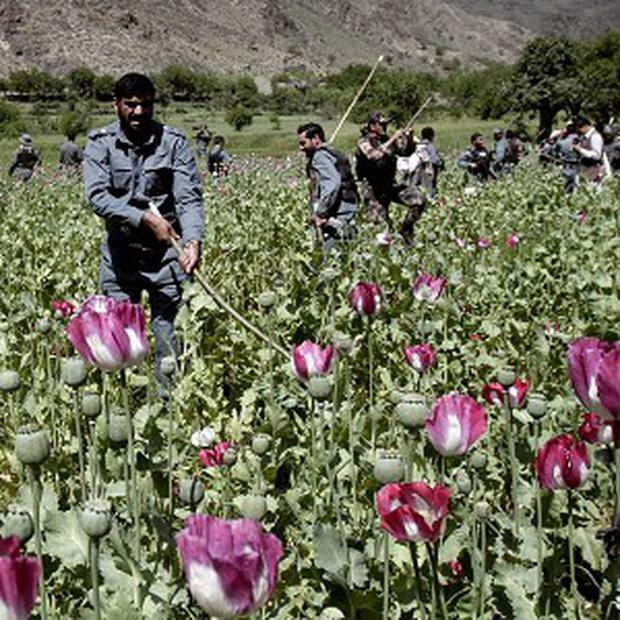 Even Afghan provinces with some past successes in combating poppy cultivation saw those trends reversed, according to this year's annual UN Office on Drugs and Crime (UNODC) report. The withdrawal of foreign troops next year is likely to make matters worse, said Jean-Luc Lemahieu, the UNODC regional representative in Kabul. He warned that as international assistance falls off, the Afghan government will become increasingly reliant on illicit sources of income. Uncertainty is also driving up poppy production, as farmers worried about the country's future turn to the tried and tested. The big increase in production began in 2010 when farmers rushed to plant to take advantage of soaring prices, a result of a crop disease the previous year, the US military surge in the south and the announcement of the US and Nato's transition out of Afghanistan, Mr Lemahieu said. He added that those who benefit from the drug trade include farmers, insurgents and many within the government. Often, he said, they work together. Khan Bacha, who cultivates a small plot of land in eastern Nangarhar province, a Taliban stronghold, said this week that the insurgents charge farmers a "religious tax" of one kilo of opium for every 10 kilos produced - though the price is "negotiable". "They say we are going for jihad," Mr Bacha said. "It is the god money we give." Past attempts by the international community to combat opium cultivation have included introducing alternative crops and paying farmers in some areas not to plant poppies. That backfired when farmers elsewhere started growing poppies in the hopes of getting money if they stopped. Cultivation also appears to be spreading to new parts of the country - with Afghans planting poppies in 516,450 acres across 17 provinces this year, compared with 380,540 acres in 15 provinces last year, according to the report. The vast majority of Afghanistan's poppy cultivation takes place in the south, south west and east, areas where the Taliban insurgency is thriving. But Kabul province in central Afghanistan saw a major spike, with a 148% increase in cultivation between 2012 and 2013. But it wasn't all bad news in the report, which said Afghanistan has expanded its social services to deal with a growing addiction problem at home. By Associated Press Reporters North Korean leader Kim Jong Un is to visit Russia and meet President Vladimir Putin, state media said. By Michael Liedtke and Tom Krisher, Associated Press Tesla expects to have full self-driving cars in which humans will not have to touch the steering wheel by around the second quarter of next year.